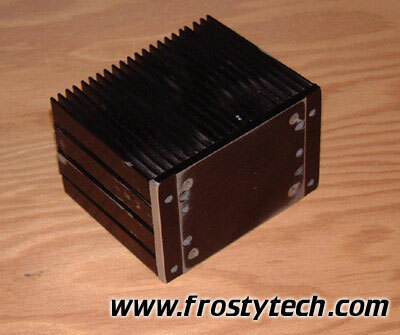 Abstract: This is a custom thermoelectric cooled heatsink for the GeForce 4 videocard!! After a few weeks of spare time in the work room Frosty's GF4TEC Active Heatsink has been finished, and tested on a live MSI GF4 Ti4600. We'll get to the temperature and overclocking results in just a second, but first lets look at what went into making our custom thermoelectric cooled heatsink. The FrostyTech GF4TEC Active Heatsink employs a few ideas which have been rolling around in the back of my mind for some time now. After reviewing so many different makes and models of heatsinks for processors there are are a few things that begin to stand out. The first and foremost is a technique we've devised called Angled Fan Orientation. We first applied Angled Fan Orientation about two years ago to improve the cooling performance of pin-based heatsink we were testing at the time. It can be used on just about any type of heatsink given the right prerequisites are there however. As the name suggests, Angled Fan Orientation (AFO for short) essentially means angling the fan to the heatsink so that the exhaust air hits it in a certain way. I won't go into the specifics in this article, but basically what you will see in the following images is an adaptation of that technique. We did some tests a long time ago of AFO vs. standard impingement fan orientations and the difference could be as much as 6 degrees Celsius. The full list of steps, and a ton more of photos have been posted in the FrostyTech Forums here. If you want some more detail on how we built this little guy I suggest you stop by an look over the logbook of its construction at some point. Basically we took a full sized Alpha P125 heatsink and cut off part of the sides to make it short enough to fit on the GPU without knocking over any capacitors, or other components. The base of the Alpha heatsink was lapped to remove any marks caused by drilling in a series of eight holes which would be used to hold the copper plate, and TEC in place. One or two revisions came and went until we finally found a design which accomplished everything we needed in the best possible way. Since we are using a surplus TEC removed from an old Swiftech MC1000 there really wasn't much work to be done. The Melcor TEC came prepared with wires, and a Molex power connector. It was literally only a matter of properly positioning the TEC on the base of the heavily modified Alpha heatsink, applying a thin coat of Coolingflow ceramic based thermal compound and then mounting on the copper base plate in place. I tend to prefer this material over Arctic Silver because it has pretty good thermal properties and is easy to clean up. Another benefit of the ceramic material is that it is non-conductive. The last thing you'd want is to accidentally short out a high-current by whatever freak coincidence, and in any case you really shouldn't use much thermal paste with a TEC anyway. I used a small rubber block to spread out the material to a very thin layer over the entire surface of the TEC. For this project we decided against potting the TEC with silicon, and instead filled the space between the copper and Alpha heatsink with some rigid blue insulation foam (similar to the kind used in construction of homes). This foam is easily accessible, and we had some lying around so it was an easy decision. The insulation helps keep the heatsink from warming up the copper, and when the GF4TEC is shut down, it also helps keep a lot of the water from getting into the TEC if there was frost. 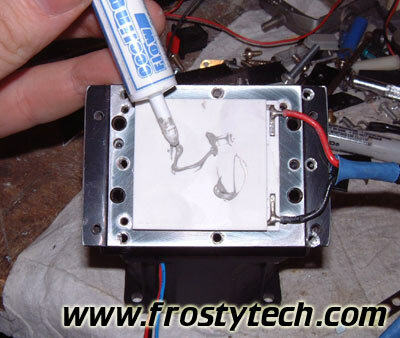 List all FrostyTech.com heat sinks that Frostytech tested?